Popeyes Louisiana Kitchen is hardly a household name in Canada, unlike U.S. fast-food franchise royalty such as McDonald’s Corp. (MCD-N98.950.130.13%) or Burger King Corp. But the mid-sized U.S. restaurant chain and others like it have their sights set on expansion to the north. 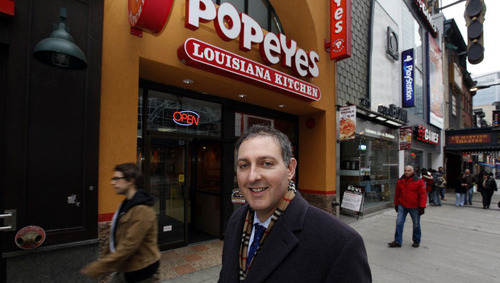 Andrew Skehan, international chief operating officer for Atlanta-based Popeyes, said his chain now has 63 locations in Ontario, most of them clustered in the Greater Toronto Area. New outlets, including one in downtown Toronto’s east end that opened recently, keep cropping up. While Mr. Skehan says Popeyes’ U.S. business is still thriving despite the tough times, many franchise companies seeing slower growth in the United States are now looking to Canada. Lawyers and industry observers say the move is driven by Canada’s healthier banks, which are more likely to lend prospective franchisees money, and its healthier economy, which means consumers may have more money to spend on guilty pleasures such as fried chicken. However, some U.S. brands expanding into Canada for the first time could be in for a surprise, lawyers who represent franchisors here say. Relatively new laws in several provinces impose different, and some times more complex, rules on companies seeking franchisees to open branches of the business. The laws are designed to protect mom-and-pop franchisees from being exploited by their more powerful corporate franchisor partners. It has resulted in court challenges involving some of the most popular fast-food brands, including the iconic Tim Hortons, from franchisees who allege their corporate parents of unfairly squeezing them for profits. In many recent cases, lawyers who practise in this area say, judges have favoured franchisees. Despite this, U.S. chains are increasingly interested in moving into Canada, said Larry Weinberg, a lawyer with Cassels Brock & Blackwell LLP in Toronto who acts for franchisors, including Popeyes. In the past few months, he said, he has attended conferences in Baltimore and Las Vegas where scores of U.S. brands expressed interest. Other clients of his that are planning moves into Canada include Qdoba Mexican Grill, which has 700 U.S. locations; and Famous Dave’s of America Inc., a barbecue chain based in Minnetonka, Minn., that recently signed a deal to open its first Canadian restaurant in Winnipeg. Mr. Weinberg said the stronger dollar and the relatively health economy have made Canada attractive for U.S. chains. But he and other lawyers who work for franchisors warn that the legal climate in Canada around franchising could end up scaring away investment. Ontario, Alberta, PEI, and New Brunswick all have franchise laws that force franchisors to produce disclosure documents, which resemble mini-prospectuses, to prospective franchisees. Soon, Manitoba will have a similar law. Although such laws are common in the U.S., the requirements in Canadian provinces are different. Mr. Weinberg said that if the costs of redrafting the U.S. disclosure documents to meet various standards across Canada are too high, some U.S. brands might not want to make the effort to expand here. Jennifer Dolman, a Toronto litigator with Osler Hoskin & Harcourt LLP who acts for franchisors, said recent “harsh” rulings have seen judges favour franchisees in disputes. Another concern for U.S. franchisors is their trademark, she said. If another restaurant in Canada is already using a name similar to a U.S. chain, expansion could involve expensive litigation. For example, Minneapolis-based Buffalo Wild Wings Inc., which recently expanded into the Toronto area, has faced litigation over its name in a battle with Wild Wings, of Aurora, Ont. Despite potential pitfalls, the flow north continues. Andraya Frith, Ms. Dolman’s colleague in Osler’s franchise law group, said business from U.S. franchisors has picked up dramatically after going into “pens-down mode” during the 2008-2009 financial crisis. Why would you care if you don't eat there? Because all that greasy, salt-laden food drives up our medical costs due to heart attacks and diabetes. Read the G&M article ''Era of cheap food' is over for Canadians". It's possible to eat at Popeye's and get the same 'nutrition value' as a typical sandwich from a good old Canadian deli. So low-income families that want to go out to eat are restricted from doing so until they save up enough money to dine at one of the Grandpa Canuck Approved eateries. Correct Erika, they are restricted from doing so as our health regulations are stricter than the U.S regulations…keep your obesity causing eateries to yourselves. I do believe it's into 'epidemic' proportions down there now, isn't??? Peter, Grampa & Matters have a strong point. "Among men, obesity and low household income were associated with higher odds of functional limitations"
all Canadians, including fatty boys in the upper household incomes as well as the physically fit in any household income class should be denied the choice of eating in a Popeye's Chicken place. Because fat Canadians of low incomes lack the discipline to control themselves in a land that has fast food 'restaurants' every Canadian will be prevented from eating at one. And without any evidence that poor fat Canadians got chubby as a result of fast food. "Because fat Canadians of low incomes lack the discipline to control themselves in a land that has fast food 'restaurants' every Canadian will be prevented from eating at one. :"
No, actually Erika, it's because of fat American's that we don't want your crap….can you process that simple logic instead of spinning it upside down?? Good point mastersknot. Great post. Clearly our franchising regulation does not go far enough if US chains are proliferating. Oh gosh - we are already big and fat as a nation and now we have more reason to get fatter????? Prefer Canadian grown home made food any day! Oh mah friend then you ain't never tried them red beans and rice. Or them biscuits. Make yo toes curl. If American fast food chains find Canadian laws too onerous, they can go somewhere else. "Although such laws are common in the U.S., the requirements in Canadian provinces are different. Mr. Weinberg said that if the costs of redrafting the U.S. disclosure documents to meet various standards across Canada are too high, some U.S. brands might not want to make the effort to expand here." Does anyone really care? I don't think that any of the existing or proposed fast food outlets has even one item on its menu that's fit to eat!! Government took on the tobacco industry and won. It is time to do the same thing with the fast food industry. I'd say, keep them US food franchises away, with McDo, KFC and the like, we have more than enough in Canada, more than enough junk food. Although I don't eat there, their crappy food endanger the health of patrons which means more health care expenses. Just say no. There's enough silly business up here. I visited Europe this year for the first time in half a lifetime and I loved to see how the mom and pop restaurants thrive. Here we walk like mindless drones into the next Tim Horton's on the block, the latest US-born fat-food restaurant, or the mega-mall franchise or corporate clothing store. It's nice to see that American franchises are looking north for expansion but at the same time, they should also realize of the many closures of Subway restaurants, Quiznos, KFC and others just to name a few. There's not that much gold in 'them thar hills'. Wake up America. "Mr. Weinberg said that if the costs of redrafting the U.S. disclosure documents to meet various standards across Canada are too high, some U.S. brands might not want to make the effort to expand here." They can draft franchise agreements for each of 50 U.S. states, but drafting them for 12 Canadian provinces may be insurmountable. What crap! The 'food' looks gross (checked out their website), but hey, what's wrong with a pedicure? It may not be exciting, but it doesn't make you fat, clog your arteries, or raise your blood pressure, in fact it can feel great! More McSh!t for the lazy, obese, hard-of-thinking. They had a popeyes in Coquitlam, it only lasted three years. "Our business is very healthy up there,” Mr. Skehan said in an interview. “Compared with the U.S., your economy has weathered the recession much better.”"
"Our customers are very healthy up there…" Not for long. This kind of food should be banned from Canada and the world. It is worse than alcohol or cigarettes which are taxed heavily. I propose a FAT FOOD TAX of 30%. "Halal chicken"…that's kinda neat. Do the chickens know? Do they have a choice of halal or non-halal? What about the food they eat? is it halal too? I gotta check up the religous history of this halal idea. Might be something to it. Maybe the chickens relax more under halal conditions and the meat is then nicer. God surely must be great if he can see and hear all those chickens being done in every day. Anyone eating out…plays with fire,as far as the health is concern. However the best reastaurant is "LA CASA DE LA MONNA"!!!! Our love of junk food knows no bounds. "only in America"….keep defending our "freedoms" with the government telling us what we can have and not have. this is food we speak of, not arms. Some freedoms are worth protecting but with the jist of these comments, most are indoctrinated into whatever works for Tims. If Canada wants to improve health care here, banning these new fast-food franchises would be a place to start and will save a $hitload of money down the road. If not, look for increased obesity and higher transportation costs as we upsize to larger cars. Charging a fat tax is ok. Provided that there is an offsetting subsidy for fresh vegetables. Buying a franchise is volunteered slavery. OK, so honestly what is the truth here? In yesterdays story on rising food prices in Canada the G&M states: "…Mr. Porter does not believe the pressure on food prices will ease as some raw commodities prices continue to rise, just as a weaker Canadian dollar makes imports more expensive." In this story it states: "…Mr. Weinberg said the stronger dollar and the relatively health economy have made Canada attractive for U.S. chains." So which is it? how can the Canadian dollar be stronger and weaker at the same time? Yes. It depends on the time frame. Stroger than ten years ago. Weaker than six months ago. What total bunk… and a poorly researched article as well. The US has had "full disclosure" laws on pro - forma(s) (expected revenues/earning, based on real examples) for franchise operations for DECADES. Bring on Famous Dave's!!!!! wicked BBQ!!!! Popeye also serves "halal chicken", really delicious!! As Canada's largest independent, family-owned chicken processor, Maple Lodge Farms is also one of the largest producers of Halal food products. @stahingcalm…which is why I don't buy chicken from this Islamic appeaser company. These controls are not just for American franchises but also for small Canadian businesses with controls galore that weaken the revenues with fees for this and that and no Canadian can get an honest meal at a reasonable price. Hence a Canadian cross border shopper usually has a nice meal when shopping in the US. You mean like that $50US eggs benny for two I had in Seattle back in'99? Custard Pie, you must have dined down at Wright's Pier where every visitor gets stiffed but with a white table cloth. You cannot argue that restaurant fares cost less in Canada but if you do it is because you do not know to travel.